Many seasons came through my mind: spring, summer, autumn, winter, but also holiday season, ice-cream season, rain season. In Holland we have a lot of rain during every season. In autumn we have those grey days with no sunshine, only clouds and rain. On such days you often see umbrellas, sometimes in bright and shiny colours with almost invisible people. Those umbrellas make me smile. The background of my quilt is string-pieced with variegated fabric. I made it with diagonal strips to suggest the rain. The people are made with grey organza. For the umbrellas I used bright and shiny fabric and put extra batting under each umbrella. 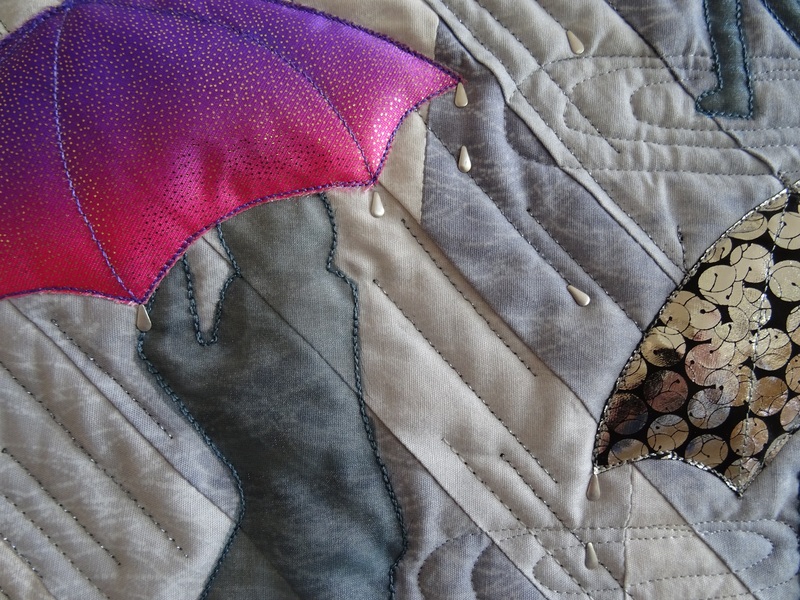 I embellished the quilt with raindrops. What a blustery day, how the people are hurrying along to get to their destination. I really like this quilt with the bright cheerful umbrellas helping to keep them from the rain. Well done. Beautiful rhytm and composition. The umbrella’s really lighten up the dreadful grey rainy day. The quilting enhances it and I love the raindrops. Delightful! 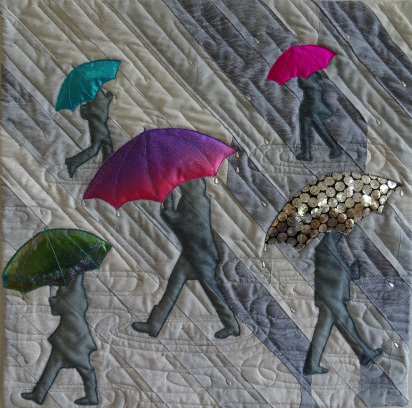 The strip piecing and quilting really evoke the feeling of a downpour — and the umbrellas are just plain fun in those bright, shiny fabrics! I just love this, the contrast of the grey day and the bright umbrellas reminds me why I choose not to live in northern Europe! You have captured a rainy day perfectly. We have the driving rain in NZ and a common sight is an umbrella in a rubbish tin after it has turned inside out in the wind. A very realistic piece of work.